Stockholm (Sweden), 15 February 2018 - “The Solutions Summit is an important milestone in our journey to end violence against children. And we have strong reasons to feel encouraged by the excellent national experience and tangible progress that is being made on the ground. But much remains to be done to protect every child from violence and we need to move ahead with a deep sense of urgency” said Special Representative of the UN Secretary-General on Violence against Children, Marta Santos Pais, during her address at the End Violence Solutions Summit in Stockholm on 15 February. 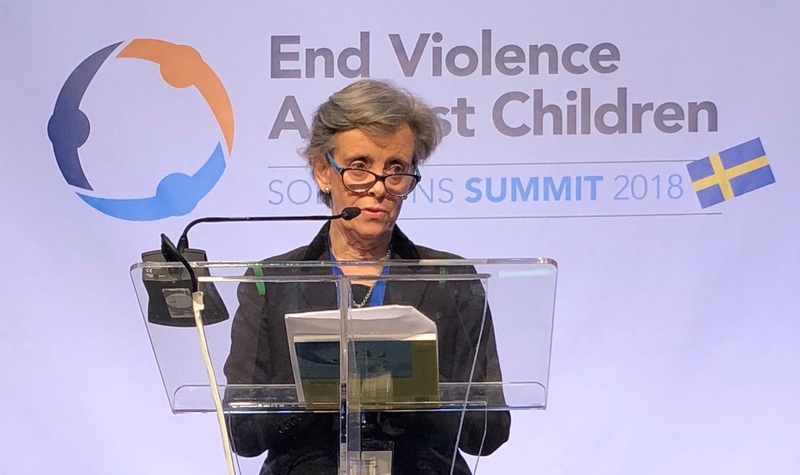 The End Violence Solutions Summit gathered leaders who share the common goal to end violence against children, with over 400 delegates and 35 Ministers from countries around the world participating in the Summit on 14-15 February. · More than 90 countries now have a comprehensive policy agenda on violence against children. · There are important regional plans to promote violence prevention and monitor national progress, most recently in ASEAN where a baseline study on implementation of its regional plan has just been launched. · In Indonesia, children’s protection from violence is a core priority in the national development plan, helping to influence policy actions across sectors and catalyze progress towards the Sustainable Development Goals. · Paraguay established a high-level coordinating body with representation from relevant authorities and civil society organizations, to promote synergies, ensure cross sectoral coordination, mobilize needed resources and assess implementation progress. · Progress is being made in legislation banning all forms of violence against children: Sweden broke new ground with its 1979 law; and today, more than 50 states have enacted similar provisions, with many others are moving in the same direction. · A recent landmark law in Brazil provided detailed guidance to protect the rights of child victims and witnesses, including through confidential child-sensitive counseling, reporting and complaint mechanisms, as well as safeguards to prevent re-victimization. · Chile has established an independent Ombuds for Children to uphold children’s best interests, receive their complaints, access and protect them in residential care and detention centers, and influence public policies for their effective protection. · New research by the Children’s Ombuds in Poland assessed attitudes and behavior towards corporal punishment within the home, showing how the enactment of the legal ban in 2010 is helping to increase levels of disapproval of this practice. While encouraged by these positive developments, SRSG-VAC Santos Pais stressed that the task at hand remains enormous and emphasized how important it is to move ahead with a deep sense of urgency. “Still today, children are intentionally targeted in politically driven processes, manipulated by organized crime, forced to flee community violence, sold and exploited for economic gain, groomed online, disciplined by violent means, sexually assaulted in their homes, neglected in institutions, abused in detention centers, bullied in schools, tortured as a result of superstitious beliefs or harmful practices” she said. “In addition to the dramatic toll this takes on children’s lives, the economic costs, some US$ 7 trillion according to best estimates, are enormous. At the same time, we know that proven prevention strategies can have very large returns on investment, saving money that can instead be invested in services for children,” she added. SRSG-VAC Santos Pais noted the strategic importance of the annual United Nations High-Level Political Forum (HLPF) in the implementation of the 2030 Agenda and in monitoring progress toward Target 16.2.